~- Hello Daly -~: What is cuter than a Vespa? My husband was going to let me assemble my electric scooter but decided against it saying, "You're cute but you're not a mechanic." True. So he put my scooter together and I assisted him much like Vanna White does on Wheel of Fortune. Looking back at our photos, we thought we looked like dorks on the scooter (at least I did, resembling someone who's mentally challenged). 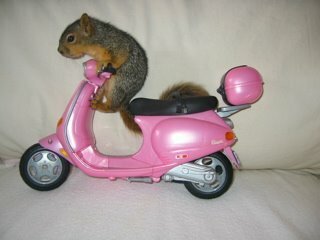 While I may not be the cutest on a scooter, this squirrel on a pink Vespa (I found on Humane Mewsings) is adorable!